Who’s the best Bric now? Despite a poor reputation, Russia’s economic indicators are among the most favourable when compared to those of its Bric peers. Only a year ago, commentators were calling for the “R” in Bric (Brazil, Russia, India, China) to be removed after the global economic crisis hit Russia particularly hard. But now the economy has bounced back, the mood has turned and some are asking whether Russia is actually the best of the bunch. The difference boils down to a question of quality over quantity. Most of the international investor focus is on China simply because it has a population of 1.3 billion: if a company can sell a widget in China, it will sell hundreds of millions of them. But a report from Russian investment bank Troika Dialog in August argued that Russia is, in fact, a better bet than either China or India. “We are often subject to tirades about the supposed weaknesses of the Russian market, usually ending in the tired argument that Russia should not be part of Bric,” says Kingsmill Bond, head of strategy at Troika and author of the report. Less acknowledged is the importance of the Russian people. With a population of 142 million, Russia is by far the most populous country in Europe, and because it’s still in transition, consumer goods are in high demand. 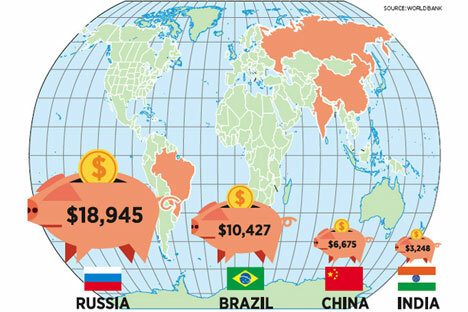 These consumers are relatively well off: thanks to a decade of strong economic growth, Russia’s per capita income (adjusted for purchasing power) is $18,945, compared with $10,427 in Brazil, $6,675 in China and $3,248 in India. Russia may have fewer people, but those it does have are the richest of all the Bric nations – twice as well off as the average Chinese and five times better off than the average Indian. Moreover, Bond suggests that 68pc of the Russian population can be counted as middle class (approximately 100 million people), against 31pc in Brazil (75 million), 13pc in China (160 million) and less than 3pc in India (30 million). In terms of who has the biggest shopping public, China obviously wins, but the gap with Russia is actually fairly small. Differences in the social standing of the populations also explain the difference in the rates of growth between so-called Chindia (China-India) of 8-10pc and Russia at 4-6pc. Russia is already a sophisticated, industrialised society with a well-educated, cultured population, whereas China and India have only just set out on the path to create that sort of society.